Feed Horn Reflector Dish Antennas come with adjustable bracket. 5 GHz Feed Horn Reflector Dish Antennas are suitable for point-to-point and customer premises equipment (CPE) applications. These antennas are operated in 4900-5900 MHz frequency range with VSWR as low as 1.5:1 and front-to-back isolation of greater than 30 dB. Units are offered in 23 in. or 28 in. sizes with two Type-N female connectors and a J-arm pole mount. Antennas reduce interference and improve throughput and signal levels. KP Performance Antennas, a manufacturer of WISP antennas and accessories, has introduced two dual-polarized feed horn reflector dish antennas that are ideal for point-to-point and customer premises equipment (CPE) applications. KP’s 5 GHz feed horn antennas have an adjustable bracket that allows for vertical/horizontal or ±45-degree slant polarization schemes and delivers 27 dBi and 30.5 dBi, respectively. These antennas operate in the 4900-5900 MHz frequency range and provide VSWR as low as 1.5:1. They can be used with radios such as Mimosa, Cambium, UBNT, MikroTik and any other 5 GHz dual-connectorized radio. These feed horn reflector dish antennas deliver front-to-back and port isolation greater than 30 dB and cross-polarization discrimination greater than 24 dB. 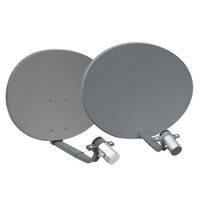 They feature two Type-N female connectors, a J-arm pole mount and are available in dish sizes of 23-inches or 28-inches. These antennas are built to sustain high-winds and resist sun-fade and rusting. They can also be special ordered with a company logo added to the dish face. “Our 5 GHz dual-polarized, high-gain, reflector dish antennas are designed to reduce interference, improve throughput and signal levels, and increase coverage areas. They pair with Cambium, Mimosa, UBNT, and MikroTik connectorized radios and are very effective solutions for any point-to-point application,” says Justin Pollock, Ph.D., Antenna Engineer at KP Performance Antennas. These new dual-polarized feed horn reflector dish antennas are in-stock and can be ordered directly from the KP Performance Antennas website at https://www.kpperformance.com/pages/new-wisp-antennas-and-accessories/dual-polarized-feed-horn-reflector-dish-antennas.html. For inquiries, please call 1-855-276-5772. With decades of in-the-field expertise as former WISP operators and Ph.D. antenna engineers, KP Performance Antennas helps wireless internet service providers maximize ROI with products engineered to exceed industry expectations by delivering superior throughput, greater service coverage, dependable performance and reduced maintenance costs, while also providing responsive service, expert technical support and same-day shipping. KP Performance Antennas is an Infinite Electronics company http://www.infiniteelectronics.com/.